Mulatu Astatke & His Ethiopian Quintet - Afro Latin Soul Vol. 2. Vinyl LP. Bleep. The modern consensus is that Mulatu Astatke’s best years begin with 1972’s Mulatu Of Ethiopia LP. However, Strut’s re-releases of Astatke’s two Afro Latin Soul albums may be about to change all that. 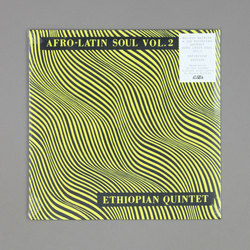 Originally issued in 1966 when Astatke was living in New York, the records are important formative works in the style that would eventually come to be known as Ethio Jazz. Despite playing under the name of The Ethiopian Quintet, Astatke’s band contained players from both American and Afro-Latin lineages as well as Astatke’s Horn Of Africa style. It is this cross-pollination of techniques that makes the music so invigorating, from the funky groove of ‘Lover’s Mambo’ to ‘Girl From Addis Abada’s wild shuffle.